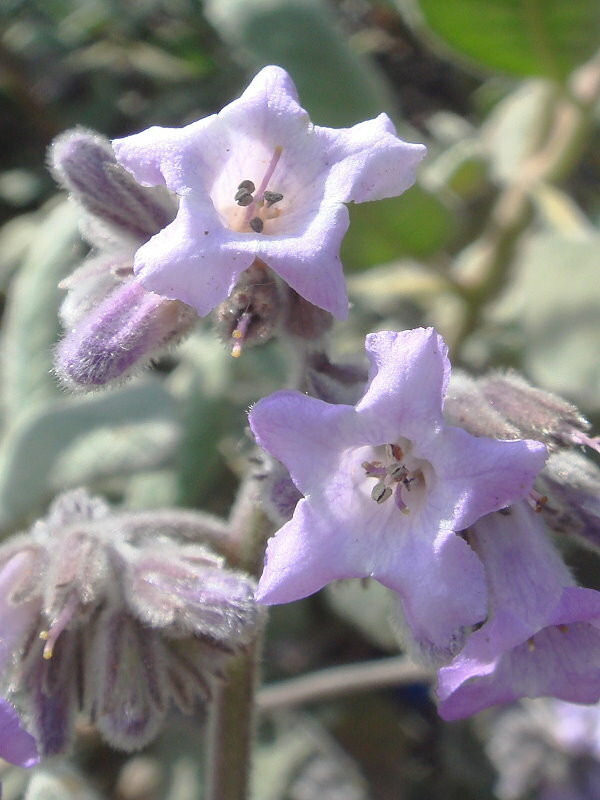 Thickleaf yerba santa is a hairy, leafy perennial shrub 3' to 9' tall with lavender flowers in coiled inflorescences and dense, short hairs on its leaves and stems. The alternate, oval leaves are gray-green and up to 6" long and 2" wide, crenate to sharply dentate. The calyx lobes are lance-linear and the 5-part corolla lobes are broadly funnelform. 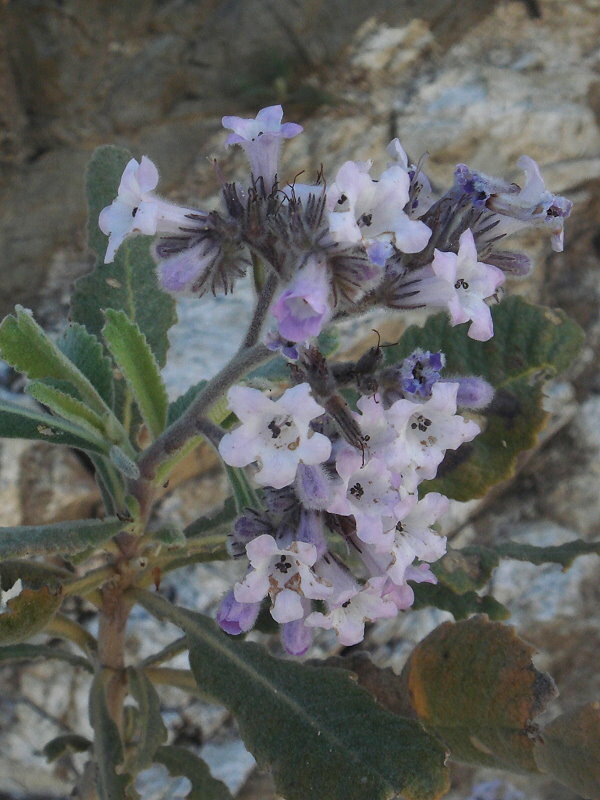 This species occupies dry gravelly and rocky places below 6000' in chaparral and pinyon-juniper woodland from the Santa Monica and San Gabriel Mts to the west edge of the Colorado Desert. It blooms from April to June. 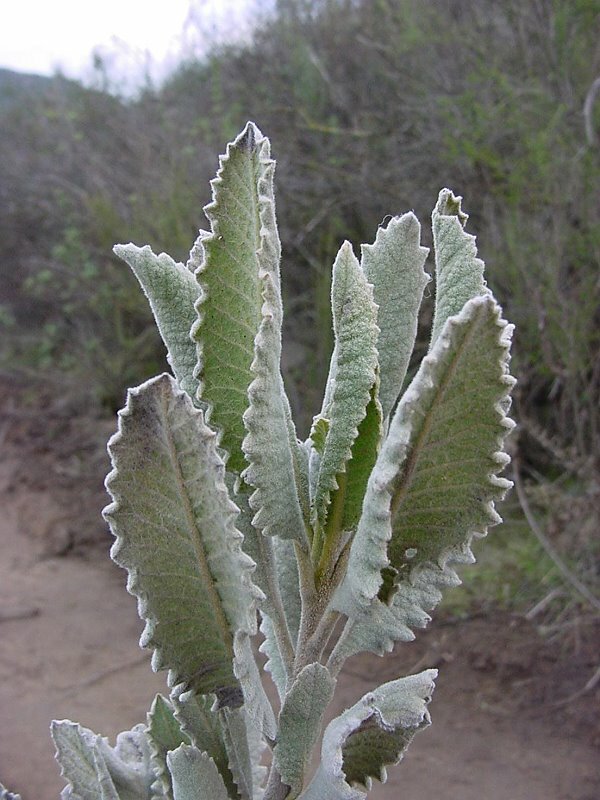 The name Yerba Santa comes from the Spanish who called it the "Holy Herb," because both they and the Indians used it as a remedy for respiratory infections and fevers. 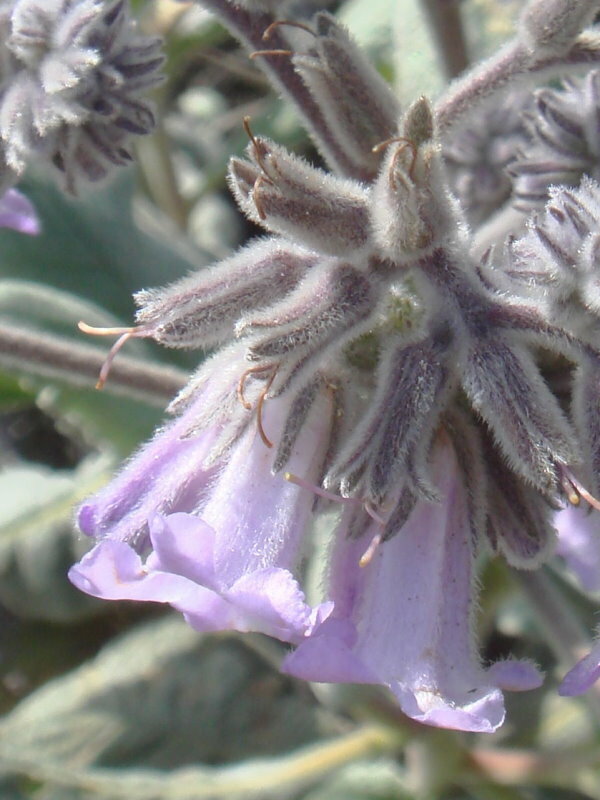 There are two variants recognized in the Jepson Manual, crassifolium and nigrescens, which occupy much the same range, and differ mainly in the extent of hairiness of the leaf upper surface, with crassifolium being white-tomentose, and nigrescens being sparsely to densely hairy and greenish. They seem to occupy much the same ranges with nigrescens being perhaps at slightly higher elevations. The Jepson Manual however, says that leaf hairiness is variable and the two variants are not easily distinguished. Leaf shape in var. crassifolium is supposed to be more ovate, while that in var. nigrescens is supposed to be more lanceolate. Nigrescens also has a smaller flower, although the sizes overlap, and the Jepson Manual does not use flower color as a discriminant. Click here for Latin name derivations: 1) Eriodictyon 2) crassifolium.